As part of the Delivering Together programme, outlined in October 2016, a community development work stream was established to examine how best community development can contribute to the transformation process. The HSC Transformation Community Development Work Stream has today (25 June 2018) reported on its findings to date, makes key proposals and sets out a proposed implementation plan for its proposals over the course of the next decade. 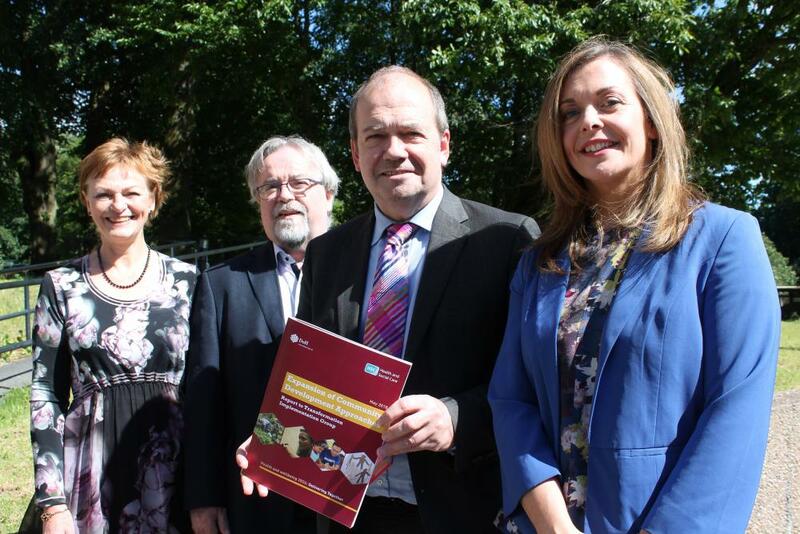 Entitled 'Expansion of Community Development Approaches’, the report has been compiled following an extensive engagement process and aims to inform the wider work of the Transformation Implementation Group (TIG), which is leading on the design, development and implementation of major change within health and social care in Northern Ireland. Community development is a process whereby community members come together to take collective action and generate solutions to common problems. Community development has the potential to improve health outcomes and reduce health inequalities. The process itself builds on the strengths or assets of the community, creates social capital, and enables participation, empowerment and the growth of self-efficacy. All of these features build strength and resilience in communities which can help reduce the negative impact of conditions on health, create greater ability to deal with adversity, and develop greater confidence to address needs holistically and in partnership with others. Mary Black, Assistant Director of Public Health at the Public Health Agency (PHA) and Chair of the Community Development Work Stream under the Transformation Programme, said: “Whilst there have been significant improvements in health for the whole population over the decades, these benefits are not evenly distributed. The gap between the most and least affluent parts of our society persists, and in some instances is widening. “Community development has a strong contribution to make in achieving health and wellbeing outcomes. The health and social care system can only ever address a limited dimension of health. We need to place communities at the heart of the work to improve people’s health and wellbeing to make it as effective as possible at grassroots level. “Community development and empowerment can unlock a much healthier future for individuals and neighbourhoods right across Northern Ireland. Chief Medical Officer Dr Michael McBride said: “Health inequalities remain one of our biggest challenges as we look to the future of improving people’s health. For example, the rate of mood or anxiety disorders experienced by people is two-thirds higher in the most deprived areas than in the least deprived. Meanwhile, the rate of alcohol-related mortality in the most deprived areas in four times higher than that in the least deprived. “As we reach the 70th birthday of the NHS, it is an opportunity to look at the challenges we face today, and those that will emerge as we look ahead to the 80th and 90th anniversaries, and plan now to face these head-on. The report is available from download on this page.